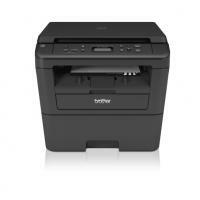 The Brother DCP L2520DW is a product aimed at the small office and home segment of users. It comes with the promise of good print quality and easy connectivity. The printer comes with a printing resolution of 2400 x 600 dpi, it is quite fast for what its worth with a first print copy out time of 8.5 seconds and overall printing speeds of 27 ppm. The results from the printer are of high quality, sharp and crisp. The monthly duty cycle is up to 10000 pages and to help matters it comes with a high yield Brother DCP L2520DW Toner Cartridges of up to 2600 prints. The scanner has a maximum resolution of up to 600 x 2400 dpi. This is a compact printer, with feeder tray capacity of up to 250 pages. The connectivity is by USB or WiFi. The scan to feature of this printer send the scans direct to email, image, OCR or save was a file. This greatly enhances the ease of use and saves time too. The connectivity even supports Airport by Apple and Google cloud print, along with Brother’s own iPrint&Scan. The automatic duplex printing adds to convenience and ease of use. It also has a manual bypass feeder for any special print needs. Brother DCP L2520DW is aimed to impress the small office and home segment with tis good quality of print and scan and fast performance. And impress it surely does. While price wise it is on a higher side considering many other products available, but it gives a good combination of low operating costs, good quality outputs and heavy duty work cycle, making it a better option among the available options. How to replace the drum unit? The Brother DCP L2520DW printer has a Brother DCP L2520DW Toner Cartridge and drum unit assembly within it. This unit has 2 separate components. When you purchase the printer, you get a toner cartridge along with the package. The drum unit is already fitted within the printer. When this unit requires replacing, the printer will display a message to do so. You can purchase a drum unit online like the Brother DCP L2520DW Toner Cartridges. The replacement process of the drum unit is done in two parts. First the drum unit is replaced and then the drum counter is reset. Q. Do compatible Brother DCP L2520DW toner cartridges really surpass OEM standards in terms of quality and performance? A. Yes, these toner cartridges are manufactured to give supreme yields and their quality goes beyond what you’d expect from OEM standards. Q. How many pages do Brother DCP L2520DW toner cartridges (TN2320) print? A. It prints up to 2,600 pages. Q. I’d like to know if compatible Brother DCP L2520DW toner cartridges come with the same efficient and quality services and are delivered as quickly as genuine cartridges. I’ve been thinking about using compatible toner cartridges as the genuine ones that I’ve used are turning out to be quite expensive. Q. Is the quality of print that Brother DCP L2520DW toner cartridges (TN2320) yield good enough for professional interactions? A. Yes, these toner cartridges also produce very sharp and dark texts which will suit your professional requirements. You can also use them to print images and graphics that are sharp and clear. Q. Are Brother DCP L2520DW toner cartridges available in high yield capacity? Are high yield toner cartridges good for printers’ durability? A. These toner cartridges are available in high yield version. They print more number of pages as compared to regular cartridges. They are perfectly suitable and wholly safe for printers. Q. Are compatible components like Brother DCP L2520DW toner cartridges tested properly before being sold? A. Yes, compatible ink cartridges are third-party tested and only then okayed and passed to be sold to customers. Q. Can I use Brother DCP L2520DW toner cartridges for printing good quality images and graphics? A. Yes, these toner cartridges are perfect not only for printing text but also images and graphics. Q. My Brother DCP L2520DW has stopped working and I am not able to identify the issue. FYI, I have recently replaced the Brother DCP L2520DW toner cartridges, could that be the issue? A. It is very unlikely for a printer to completely stop working due to Brother DCP L2520DW toner cartridge replacement. Even if there seems to be a problem with your machine, you can correct most problems yourself. The machine's power cord is connected correctly and the machine's power is on. All of the machine's orange protective parts have been removed. Paper is inserted correctly in the paper tray. The interface cables are securely connected to the machine and the computer. Check the LCD or the machine's status in Status Monitor on your computer. If the LCD or your PC displays any error refer to the printer user guide to resolve the issue for each error message. Q. How many copies does a single black Brother DCP L2520DW toner cartridge yield?? A. The number of copies a Brother DCP L2520DW toner cartridge yields depends upon the quantity of ink delivered in a single copy. On moderate use of a ink the black toner cartridges yield 2,600 Pages (at 5% of coverage area). Q. How can I fix a paper jam in my Brother DCP L2520DW printer?? Pull the jammed document out to the left. Insert a strip of stiff paper, such as cardstock, into the ADF to push any small paper scraps through. If the document rips or tears, remove all small paper scraps to prevent future jams. Always remove the remaining paper from the paper tray and straighten the stack when you are adding new paper. This helps prevent multiple sheets of paper from feeding through the machine at one time and prevents paper jams. Leave the machine turned on for 10 minutes. This allows the internal fan to cool the extremely hot parts inside the machine. Q. Can you name the Brother DCP L2520DW toner cartridge and drum unit models? A. Yes, the Brother DCP L2520DW toner cartridge is known as Brother TN2320 Black toner cartridge and the drum unit for the same printer is Brother Drum Unit DR2300.